Ahmad Afif Amran took a thrilling victory in Teluk Intan, Perak as he powered his way past CP130 championship leader, Mohd Zaqhwan Zaidi in the final lap to secure his second win for the season in Round Seven of the PETRONAS AAM Malaysian Cub Prix Championship. In a spectacular 18-lap duel, Afif nicked away the chequered flag from his Givi Honda Yuzy Racing rival at the second last turn (turn 6) after the latter made a gearing mistake, completing the race in 16:58.225s. Zaqhwan who was hoping to score his fifth win for the season in front of his manager, Shahrol Yuzy’s homecrowd was forced to settle in second place with 16:59.105s. Meanwhile Ahmad Fazli Sham (PETRONAS Yamaha Maju Motor) rode a lonely race to finish third in 17:05.236s followed by teammate, Taufiq Roslan fourth and Norizman Ismail (Harian Metro Y-TEQ SCK Honda Racing) fifth. Poleman, Mohd Affendi Rosli retired from the race after four laps due to technical issues. “We could have not asked for a better weekend. We were fastest yesterday, managed to secure a front row start in the qualifying and transform it into a win,” said a gleeful Afif. “I quickly capitalized on his error to take the outside line, stole the lead and sprinted to the finish line. Thank you PETRONAS Yamaha CKJ for giving me a perfect bike today. Hopefully we can keep up the good work for the remaining rounds this season,” added Afif. Although disappointed, Zaqhwan was pleased to remain in control of the CP130 overall standings, leading it with 120 points followed by Norizman with 109 points and Afif third, 98 points. 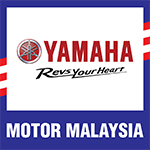 Separately Motul Yamaha YY Pang swept the CP115 podium with Tengku Amirul Haffiruddin securing victory followed by Zaidy Mohd Zaifaizal second and Izzat Zaidi Salehan third. This is the second time the all-red outfit has dominated podium with the first being in Temerloh (Round Five). Tengku Amirul bounced back from a botched start to steal the chequered flag in 14:23.883s, 0.207 seconds ahead of Zaidy with 14:24.090s. Poleman, Izzat finished third in 14:25.652s. 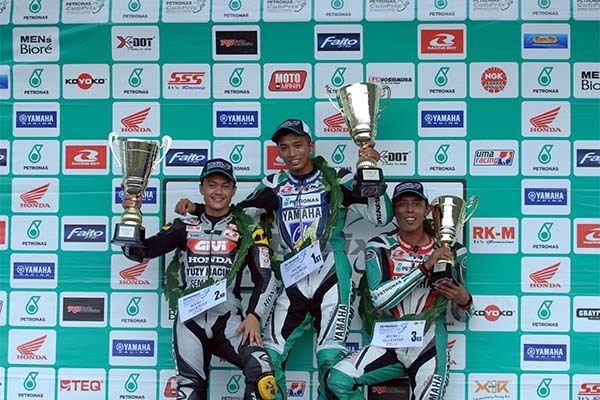 Givi Honda Yuzy Racing’s Mohd Amirul Ariff Musa and Ahmad Syukran Aizat of PETRONAS Yamaha CKJ rounded up the top five. “No words can describe how I feel now. I am extremely happy because not only is this my second victory for the season, but this also marks the second time YY Pang conquered the podium,” said Tengku Amirul. Tengku Amirul now has a total of 113 points to his belt while Zaidy continues to lead the intermediate standings with 139 points with Izzat Zaidi second, 128 points. Meanwhile Khairul Idham Pawi will have to wait for the next round to realize his WIRA title ambitions. The Kozi Yam Honda Racing rider could have clinched the crown having won the 12-lap race in 11:53.587s if title rival Afiki Supaat finished eighth or lower but the Jetron Apido Team PJM rider finished seventh instead. Even so, Khairul insisted he was more than happy to just win his home race in front of his family and friends. “There was a possibility we could wrap the championship battle here at Teluk Intan but that was never my objective. I just wanted to win at my homeground and make my supporters proud,” said Khairul. “I don’t mind waiting for the next race to confirm the title,” he added. Claiming his sixth win for the season, Khairul heads into Round Eight in Jempol, Negeri Sembilan next month hauling 166 points, 74 points clear of Afiki (92 points) while Harith Farhan takes third overall with 75 points.